Last year MusicRadar told you about Gibson's new Robot Guitar, an instrument outfitted with Tronical's Powertune automated tuning system. Now there's two new Robot models to choose from. 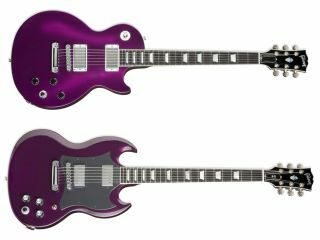 In a blow to guitar techs and roadies everywhere, the new limited edition Gibson Robot Les Paul Studio and Robot SG Special will be making their way into music stores soon. Like the original Gibson Robot Guitar, both models will feature the same self-tuning technology that offers players the options of Open E, DADGAD, Drop D and several others. Apparently, this is in response to incredible customer demand for both the original and calls for other models to sport self-tuning capabilities. The Robot Les Paul Studio features the same appointments as as regular model, only with a performance safeguard which secures the cord into the guitar. The instrument is available for a limited time (we don't know how long), in limited quantity (don't know that either), in a Purple Metallic finish. List price is $3,999.00US. Likewise, the Robot SG Special is identical to its non-robotic counterpart, only it features a performance-safeguarding Neutrik Jak which secures the cord into the guitar. It's available for a limited time and in a limited quantity in the same Purple Metallic finish (we're thinking this is a popular look). List price for this baby is $3,599.00US. Of course, it's going to be years before robots are writing for MusicRadar, so while our jobs are secure we think we ought to check these guitars out. For more information, visit the official Gibson website.